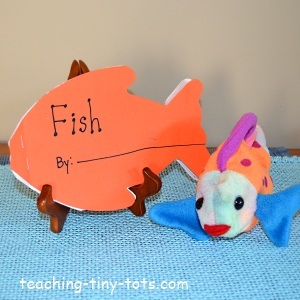 This fish shaped book is a great way to reinforce colors and pre-reading skills. This is a perfect book for preschool, kindergarten and home school! Each page reinforces a color and is a good book to "read" together because of the patterning. Trace onto cardstock or use a manilla folder to make a thicker stencil. 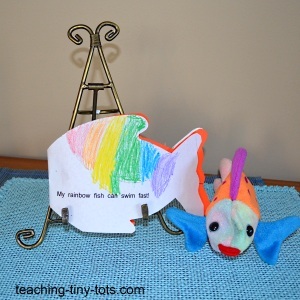 Trace onto as many pages as you would like your book to have, and trace two fish onto construction paper for the covers. Have your child cut the pages if she is proficient in using a scissors or pre-cut them before you begin. Make a list of colors with your child. Choose about 4-5 colors for your book. If your child is familiar with more colors, add a few more pages. 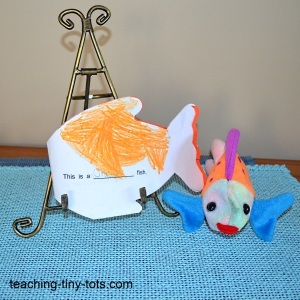 Have your child match the sentence to the picture and glue it down with a glue stick. Bind the book with a plastic book binder or staple on the edges and cover with colored tape. Or punch a few holes and weave a thin ribbon to hold it together. Place all writing under pictures on each page to keep it uniform and easier for child to know which belongs to which picture.